Our big evening was last night, as is traditional in France. Amazingly, for the first time in the thirteen years that we have lived together, we found a turkey, une dinde, for our Christmas dinner. Remi cooked it, in his own unique way. The stuffing had meat, chestnuts and grand marnier in it along with so many delicate spices...the same that he used to make a crunchy brown crust for the turkey skin. I didn't have to do anything besides bougie patrol...and there were nearly thirty candles lit on the main floor alone. Instead of carols, we listened to Miles Davis and sipped white wine that we had bought earlier in the day from our favorite winery near Uzès. The Baccarat crystal goblets were clinked repeatedly and it was just the most lovely and love-filled evening. That same spirit drifted into this morning, where bisous and wishes of Joyeux Noêl were exchanged just after having opened our eyes from slumber. We managed to surprise each other with our presents, a delight, as were those that came from family and friends. And then, pour se mettre en appétit, or to work up an appetite, we took a long walk with the dogs in the sun. Ben padded along at our side and Kipling ran amuk, as per usual. And it worked. We have popped a bottle of crémant and Remi is now cooking again, a seafood cassoulet - one of his specialties - stuffed with crab, shrimp, petoncles (think tiny scallops) and cod all cooked in a creamy white wine sauce within their own individual pots. If we can, we will taste a bit more of the triple cream Brillat-Savarin with summer truffles then the buche de Noêl for dessert! While other families will go exploring this afternoon, we are planning to stay home, quiet and cozy and content. After what has been, at times, a challenging albeit fascinating year, it feels so incredibly wonderful just to be at peace. Joyeux Noel et Bonnes Fêtes de fin d'année, Karin! Merry Christmas, Heather! Sounds like you are spending yours in the most absolutely perfect way! Peace, happiness, contentment, surrounded by the love of your favorite men! :) Those fur babies are absolutely adorable (even when they look like they are "so over" posing :) "Really, mom . . . another one? ? ?" Too cute)! How wonderful Remi is doing all that cooking! He sounds like quite the chef! ! ! Thank you for all the beautiful posts you give us throughout the year. The words, the feelings you evoke and the gorgeous photos help transport us to another place. Oh Heather, so happy for you and hear about your peaceful Xmas-feeling. We spent our evening totally unlike all the years before (actually it was the first unusual Xmas we had and how wonderful and funny too.) Went to a tiny restaurant in the old town, had a delicious dinner accompanied by rocking life music and good vibe . Today we also decided to stay at home, lit all candles we have and open a bottle wine. Dreamy or does reality will start next week? b.t.w. the dogs are sooo cute. Hopefully reality can hold off just a little bit longer...And I love that you did something so totally new for you and loved it! Let's hear it for taking risks! Merci mille fois, Elizabeth. I have said before that you were one of the first readers that I was like "wait, she isn't a family member, yippee!" and I am so grateful that you are still here, you still enjoy it and for all of your amazing support. "We have popped a bottle of crémant and Remi is now cooking again, a seafood cassoulet - one of his specialties - stuffed with crab, shrimp, petoncles (think tiny scallops) and cod all cooked in a creamy white wine sauce within their own individual pots." I would love to have a taste of that dinner. I read in Lisett's List that there 13 deserts served at Christmas in Provence. One of them is marzipan. I would settle with your desert. Edgar, it is actually called a "timbale" - I don't know why we were fixated on cassoulet as there are no beans in this dish - and yes, it was fantastic. As for the 13 desserts? As they are pretty much nuts and dried fruit, I pass! Heather, Merry Christmas to you! There was a real sense of quiet and contentedness in your post. You sound as if you are at home. So glad! 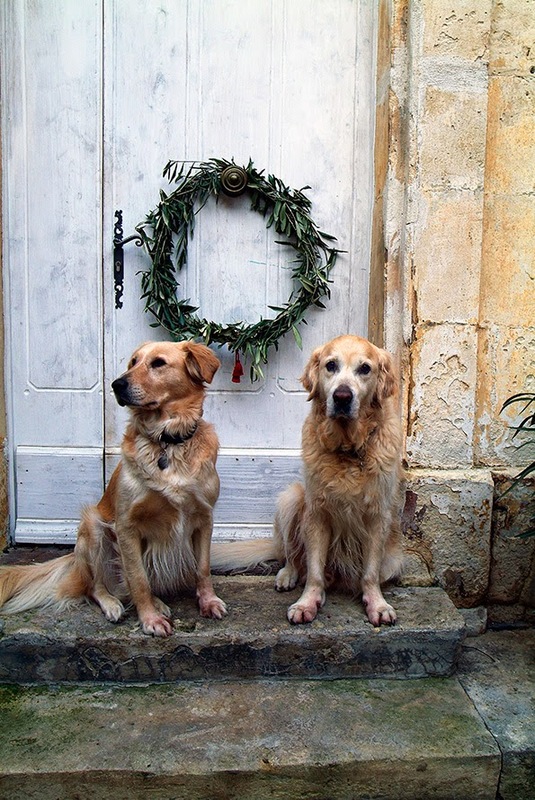 Loved the Christmas doggie photo, with the two boys on the threshold of their new den! As others have commented, I have very much enjoyed receiving and reading your posts. I look forward to them. I wish you and Remi a wonderful year to come. A year of growth and blessings! "Growth and blessings"? I'll take it, Deborah, thank you!! And thank you as well for all of your responses here too. And yes, this house really felt like home for Christmas. None for Christmas......we had the loveliest Christmas......just the two of us! Eve..and then Christmas night with a friend for 50 plus years! and her husband....delightful!! And we had "beef bourgingnon"! sorry for the misspelling! I did not pass French! Merry Christmas you darling people......and happy new year! It is the best Christmas present of my life! Our pond is the heart of my garden for me.....and the animals appreciate it even more than I do! A blog post is coming! (when I stop crying tears of happiness)!!!! Oh Penny, I can only imagine how thrilled you must be about the return of Mama duck and her friends! We recently have put out birdseed - it is tucked up in the vine trellis so to be far from the rascal Kipling - and even just watching the chickadees and sparrows come to have their breakfast in the mornings brings me so much joy. Let alone you have wonderful homes for your ducks! It is a wonderful gift! A belated Merry Christmas to you and your Husband! I forgot to say.....and I mean it from the bottom of my heart......your wreath....is my favorite....and I have seen hundreds......that will be my wreaths next year......we have many olive trees....and I adore them! gorgeous wreath....I love the simplicity and elegance of that wreath. If I had a thousand dollars......that would be my choice! Merry Christmas! (It is still Christmas here!!! Dear Heather, your Christmas sounds magical and so memorable with Remy! The peace and love you felt is what I wish for all of my friends and family. All the best and many adventures in 2015! SO, THAT I take it is your front door?? ?I ADORE IT!Your CHRISTMAS sounds........DIVINE! I salute you one day late.................with Baccarat of course!!! Must run......a lunch guest coming and HERE I SIT!!!! A heart-warming post, dear Heather. So happy yo hear that your Christmas was wonderful. 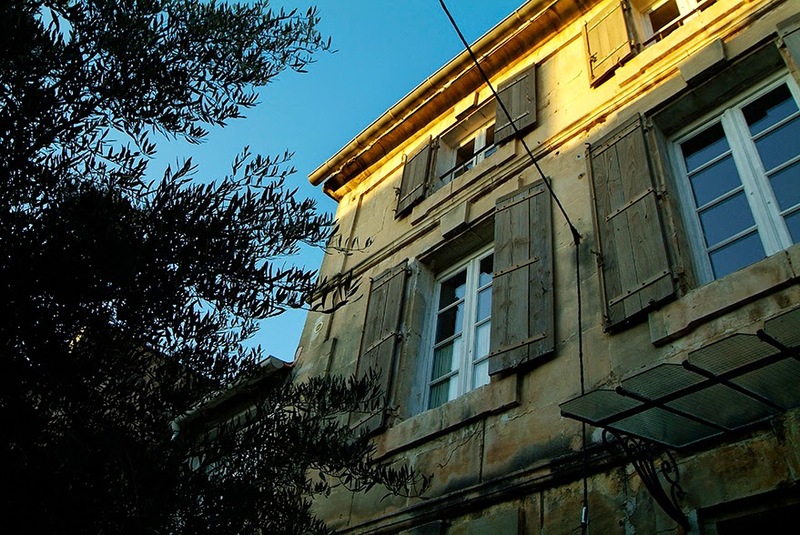 It is always a joy to come here and visit your sweet corner of Provence. Hello Helen! It sounds as if we had similar Christmas Eve and Day celebrations - just that we ate our turkey first and then the seafood feast (which we finished yesterday and it was even better). Wasn't it a treat to not have to cook for once? I loved it. Thank you for your kind wishes...Let's hope that 2015 is filled with...Health (always) and Creativity! Wishing you a lovely, peaceful holiday week et bonne annee 2015! good food, good wine, the right company, music, candles everywhere, rest in your Wonderful house... it's Heaven! We had the same atmosphere and enjoyed a lot. Happy Christmas season and Happy new year! P.S. I like to be one of your readers thanks for your photos and words! Soul food. What a wonderful Christmas in France. We drpve through the area of Uzès back in September. We were staying with Corey Amaro outside Marseilles and traveled everyday throughout the region enjoying the beautiful scenery. I have enjoyed reading your blog this past year, and wish you a happy New Year in 2015. Enjoy your Christmas time...and look forward to what adventures the new year holds! What a beautiful house it is. I particularly like your red light cords and the crystals on the chandelier. Agree that with all the Christmas hubbub, less is more. Belatedly, Joyeux Noel, and best thoughts for a happy and healthy and calm (very calm) new year. My comments are being eaten by a cyber cat but in case this get through, very best wishes.